The main Help system may be displayed using the F1 key or by clicking Help from the Toolbar. The Help contents may be searched using an index listing of the available topics, or by searching for specific words or phrases in the Help topics. Context sensitive Help is also available. 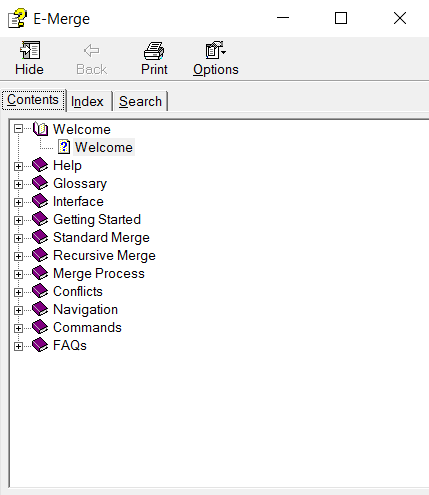 The Contents tab lists a table of contents for the Help topics available within the E-Merge Help system. The main Help topics are displayed as books, which may be opened to display related subtopics. 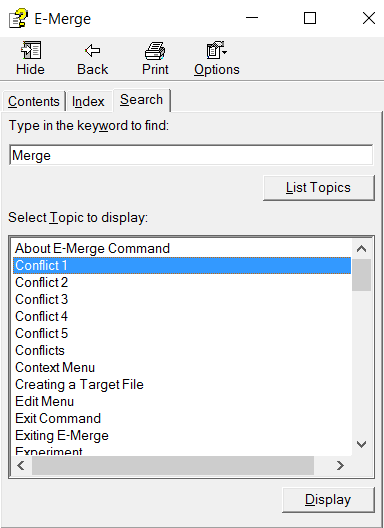 The Index tab displays an alphabetical listing of topics and commands within E-Merge. The Help information for a particular topic may be displayed by selecting the topic and clicking the Display button, or by double clicking the topic. The topics may be searched by typing directly in the first field of the Help Topics dialog, or by scrolling through the topics contained in the index using the scroll bar on the right side of the Help Topics dialog. The Search tab allows searching for specific words or phrases within the Help topics. After typing in a word to search for in the Help topics, the topics in which the word appears are listed, as well as additional suggestions to narrow the search. The Help information for a particular topic may be displayed by selecting the topic and clicking the Display button, or by double clicking the topic. Clicking the Hide button will hide the Index and Search page. Once clicked, it turns into a Show button. Clicking the Show button shows the Index and Search page. Clicking the Back button returns the User to the previously viewed screen. The Print button display a standard windows printing dialog box. The current screen will be printed for the User. 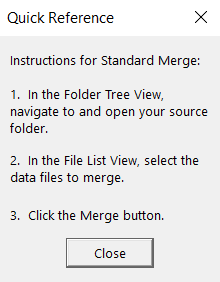 The Quick Reference dialog guides the user through the most common type of merge operation (i.e., standard merge), in which all unmerged files in a folder are merged into a master data file for analysis. The Quick Reference dialog is meant to serve as an aid in learning how to use E- Merge, as well as a reminder of the basic steps involved in a merge operation once the application has been mastered. 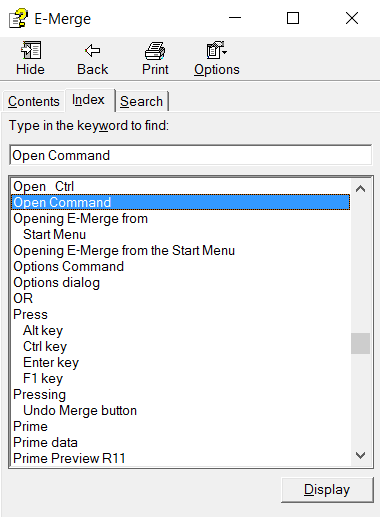 The Quick Reference dialog appears by default when the E-Merge application is opened. This default may be changed using the Options command under the View menu so that the dialog is not displayed when E-Merge is opened. The dialog may be redisplayed at any time using the Quick Reference command under the View menu, and may be repositioned on the screen by clicking on the title bar and dragging the dialog to a new position.